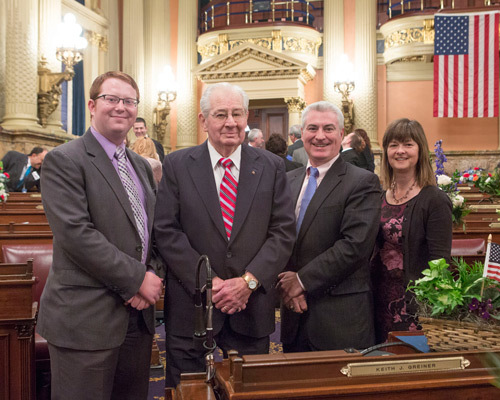 On Tuesday, Jan. 6, Rep. Keith J. Greiner (R-Upper Leacock), second from right, was sworn in to his second term representing the 43rd District. Greiner is joined (from left) by district office staffer Eric Reath, his dad, and district office manager Lori Blackiston. HARRISBURG – Rep. Keith J. Greiner (R-Upper Leacock) today was sworn in to his second term representing the 43rd District in the state House. A certified public accountant with nearly 25 years of business experience, Greiner was first elected to the state House in 2012. He previously served as the controller of Lancaster County, an elected Upper Leacock Township supervisor and an elected auditor. He is also an active volunteer with the Upper Leacock Fire Company. The 43rd Legislative District is comprised of the following municipalities: the borough of Strasburg, and the townships of West Earl, Upper Leacock, East Lampeter, West Lampeter, and Strasburg, as well as the third, sixth and eighth precincts of Lancaster Township.